If you own a residential, a commercial, or industrial property that is close to forty years old or older than chances are you will be facing a major sewer system repair in the near future. Although you would think that such a crucial system would have been built to last significantly longer, engineers and sewer system designers were limited by the materials that were available at the time. For example, at one-time sewer pipes were manufactured out of cast iron. Although it is a strong metal, cast iron tends to rust when exposed to wet conditions. Rust spots turn into rotten spots. Eventually, sewer pipe manufactures replaced the cast iron with the same clay material that is used in tiles. Clay is great at holding water and does not rust or rot when exposed to it, however the material easily chips, cracks, and breaks. That does not make for a good situation when buried underground, as the earth is always shifting and moving. In more recent times the industry has turned to PVC plastic. The material does not rust and is flexible enough that it can withstand underground shifting and movement. PVC sewer pipes are a useful solution for new construction, however, it is not the most effective way to repair existing sewer pipes in older properties. Which brings us to a question that you must be asking yourself by now. What is the best way to repair existing sewer pipes? The answer is a simple one. Trenchless sewer repair is cost-effective, does not cause any major damage to landscaping and hardscaping, and is the least time-consuming process available on the market today. That being said, not all trenchless pipe-lining procedures are equal. Like any technology-based approach, some are certainly better than others, but only one can be the best. The Nu Drain Process by Nu Flow Technologies is the gold standard of trenchless sewer repair, specifically in sewer pipe lining. Unlike the traditional sewer repair method, it does not require the excavation of a large trench along the sewer pipeline in order to expose the pipes for repair. That means the landscaping and hardscaping are not ruined during the process. The existing sewer pipeline is thoroughly cleaned with a hydro-jetting tool that incorporates the use of high-pressure water sprayed into the pipeline in order to remove any clogs or build-ups. The next step is to dig a small double-entry access point. A technologically advanced machine, developed by Nu Flow Technologies used the access point to pull a felt liner with an internal bladder through the interior of the existing sewer pipeline. The felt liner is soaked with a specially formulated wet epoxy resin. Once installed the bladder is inflated and then later removed. Once the epoxy resin cures in place a brand new pipe is formed within the existing one. The final step is to send a video camera into the sewer pipeline to ensure that the process went smoothly. The new epoxy pipe seals any breaks, cracks, and leaks within the existing sewer pipeline. It also prevents future damage and most clogs from rearing their ugly heads. The entire Nu Drain process can take as little as a day to complete from start to finish. It is a vast improvement over the traditional excavation method that in some cases requires multiple weeks to complete. 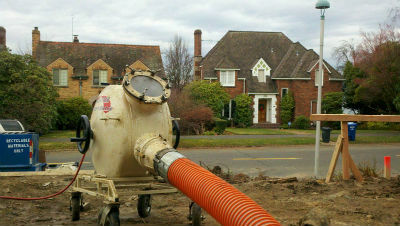 Trenchless sewer repair using the Nu Drain approach is also significantly more cost-effective. It is approximately 50-60% less expensive than traditional sewer repair methods. If you would like to learn more about trenchless sewer repair in Oklahoma City, OK or are in need of our services please contact Nu Flow Technologies today. We look forward to hearing from you.